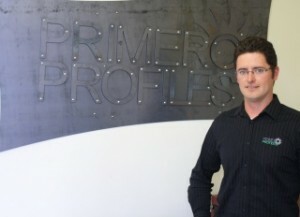 Vaughn Clark, owner manager, Primero Profiles Ltd.
Primero Profiles Ltd positions itself as New Zealand’s newest and most dynamic plate processing company, selling cut-to-size and folded steel shapes, and specialising in high-quality plate-cutting from 2-150mm thick; quick turnarounds; and high-speed production press braking. “If it’s solid advice you’re after, and a unique attitude to customers’ needs, we’re your guys,” adds Vaughn Clark, the youthful, dynamic owner manager. But don’t be fooled. He’s anything but a novice, having done 13-years in the cut and fold business since leaving Howick College; working on the floor, running a full range of machinery, advanced CAD draughting and pounded the pavements for sales. He’s not without ambition, and was prepared to take risks to deliver on that – to become the major independent in the industry within five years. Just six months into the game, he’s adding a new four-torch profile cutting machine which will double the existing cutting capacity of the firm. The staff complement has grown quickly to seven split over two shifts and continues to grow. And, he admits, he is a careful researcher who took his time checking his options before setting up Primero, undaunted by the recession. “From the start, we committed to having the leading skills in the industry; the best machinery; the latest software; and the best operators and located near our customers. If you put that in place with an enthusiastic ‘can-do’ attitude, you quickly attract a large and loyal customer base. He effortlessly fields customer orders as we move around the workshop, prices and scheduling at his fingertips. Almost on a weekly basis, top machine operators drop by to check on vacancies or to go on a list for future jobs linked to expansion. ‘Energy’ too would be a major requirement to thrive here. When ATEED part-funded an IceHouse course for fast-track companies to achieve and manage growth, Clark had no compunction in accepting it, even though it would create great time pressures. So much for the ‘soft issues’. In this game you also need the hardware to back you up too. They’ve got that in place. CNC Plasma Cutting: providing high-quality, quick turnaround plasma cut components via a hi-definition Hypertherm HPR 260KW CNC Plasma, which can cut plate from as thin as 1.0mm up to 50mm thick. The 6m x 2.5m bed allows large item manufacturing. CNC Press Brake: this 175T CNC Press Brake can fold with accuracy and speed up to 12mm plate. Its 3m width allows large item manufacturing and its networked graphical controller streamlines production for the customer’s design department. Guillotine: has the capability to cut, with accuracy and speed, up to 6mm thick plate. Its 3m width allows a cost-effective solution. CNC Flame Cutting: the new CNC 4 torch flame-cutter cuts plate up to 150mm thick. With a drive and three slave cutters, this machine can cut four parts at once. As you leave, you might notice a couple of Primero Profiles’ sign boards propped up in the corner. They’ve clearly been too busy meeting the needs of their growing number of customers to get around to putting them up. Then again that’s probably the best sign you can have.